The 22nd annual Johnners Dinner was held in the Long Room at Lord’s Cricket Ground on 13 November 2017. Many thanks to the brilliant impressionist Jon Culshaw for his very funny speech and to our master of ceremonies Chris Cowdrey for hosting another wonderful evening. More than £10,000 was raised towards funding the Brian Johnston cricket scholarship awards. 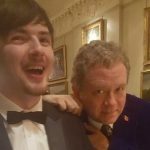 This is a photo of Jon Culshaw in the Long Room with Johnners’ youngest grandson, Sam Johnston.